It's the thirteenth season and the eleventh distinct continuity in the Pretty Cure mega-franchise. (In other words, each season is standalone and can be watched independently without having to start from the beginning.) If you're counting episodes, it's roughly 600-650. If you want old-school magical girls, these are the last champions of a genre that's been a bit unfashionable in anime lately. 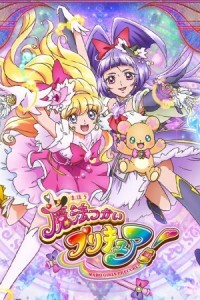 In Japan, PreCure is huge and has aired a new episode almost every week since 2004. Internationally, it doesn't get much attention. For me, it's my second season after Go! Princess PreCure the year before. I quite liked this new one, but to be honest I thought Go! Princess PreCure was better. This year's PreCures are magic-users. Mirai's from the real world and Riko's from the magical one. They meet in ep.1 and become friends. Pretty soon, they're riding broomsticks together and punching monsters into orbit. (That's not hyperbole, by the way. It happens in ep.6 and the monster explodes there.) It's all wholesome and nice. Everyone's kind-hearted and the focus is on friendship and being together, both in our world and the magical one. Very few of the episodes matter, but they're still light and heartwarming. Ep.9 has a school battle tournament where you defeat your opponent by making a flower bloom on her hat! Awesome. There are pegasus families and mermaids. There's silly magic that made Natsuki laugh. Partly due to this, I didn't think that the season felt as if it was going anywhere. The girls lived their lives and had fun, which was nice, but the villains were basically a tacked-on genre convention rather than something that belonged in the story. Even the girls don't have that much characterisation, frankly. Mirai's nice. Mofurun is a talking teddy bear and also nice. There's a bit more to Haa-chan, who's an overenthusiastic innocent who's liable to get carried away, but she's basically just another nice girl too. The only regular with decent characterisation is Riko, who takes school almost too seriously, thinks she has to be perfect and is liable to overwork herself. She's the kind of girl whose idea of trying out volleyball is to buy a book on it. She also has big sister insecurity issues. That said, though, you could argue that a lot of the show's characterisation efforts are going instead on making the world and setting distinctive. The magical world is colourful and has cool surprising stuff in some episodes. (a) Our heroines go to school, explore the two worlds and help Riko get over her issues. Token villains get easily defeated each week. (b) Baddies get permanently defeated, there's an impressive cliffhanger villain and the show does a sort of mid-season pseudo-finale. A despairing, delusional Yamou breaks the villain mould and is pretty impressive, actually. The PreCures face grief, of a sort. Admittedly all this is still comparatively light, but it's still a big step up from where the show had been. (c) Replacement villains appear, unrelated to the last lot. I don't object to most of them, but I have a slight problem with the Sumo Genie. His downfall episode is actively bad, being so bland that it has no impact despite being another mid-season pseudo-finale. Meanwhile the PreCures go on obliviously doing schoolgirl stuff, which is fine as far as it goes but is basically a season made of filler. Drama is theoretically being provided by a bee-fairy who's befriended the PreCures but is also working for the baddies, but I never cared about him because he's tiny, inconsequential and loud. (d) The show comes alive. Old baddies get resurrected, except more liable to backstab each other and think for themselves. There's a foretold great disaster. After drifting a bit earlier, I genuinely enjoyed these last eight episodes. This isn't a show that matters. It's a light schoolgirl show that also happens to have Monsters of the Week. It's slightly reminiscent of Harry Potter, but that's just the inevitable consequence of telling a story set at magical school. Even when there are similarities, e.g. a train that takes you between the Magical and Muggle worlds, they'll have a twist on it like the train being a giant snail. Its episodes are also liable to have uplifting themes and morals, e.g. Riko learning that it's good to do things for yourself instead of just relying on magic all the time. It's fine. I don't think most of it's that good, to be honest, but I'm reasonably fond of the season and I'll definitely be watching the movies as usual. There are stretches that are worth your time. Episodes with more emotional meat include eps.21-22 and ep.49, while ep.46 is a cool Christmas episode with good jokes and I was also amused by ep.34. (Haa-chan needs the concept of "girl likes boy" explaining to her and there's a funny bit where the girls ignore the Monster of the Week because they're more worried about their friend.) Ep.29 also does a PreCure Cinderella. Ep.50 has a "pass the baton" guest appearance from the heroine of the PreCure series that followed this, which I thought was rather nice. It's a reasonably good year... but you can do better than this if you're looking for a PreCure starting point.